Can you spot the errors? Educate yourself on “good” kitchen design. In Paul McAlary’s post, Good Intentions, Bad Designs, he poses the question “What design errors do you see most often, either in the media or in your local market?” This is in follow up to his earlier article, Death by Kitchen Design, where he defines several examples of kitchen design gone wrong. Some examples he describes include the range or cooktop being too close to cabinetry, a window or an entry doorway. Another hazard is having an island cooktop located too close to the edge of the island where pot and pan handles can overhang and have the potential to be knocked off the stove. Building codes are in place to regulate safety hazards in building structures, but does that mean every design project is actually safe? Another example he gives is about cabinetry that extends beyond the counter below or not having some other protective base beneath. 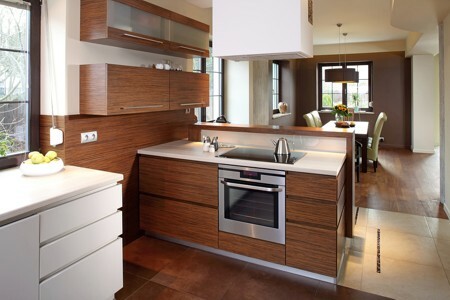 In this photo of a modern kitchen you see wall storage above and drawer storage below. What’s wrong with this picture? One potential hazard is the possibility of hitting one’s head on the underside of the wall cabinet after going into the lower drawers. While this design may technically be “up to code,” the potential for danger is still there. Designing your kitchen can be exciting and scary, throughout the whole process. While working with a professional designer and professional contractors are of the utmost importance, so is your own education and vision for your new space. As you look at different ideas, see if you are able to find instances that you think might be dangerous. Then see if any of these are designed for your new kitchen. If you find something that concerns you, don’t hesitate to tell the professionals you are working with. It’s better to address something that can be potentially harmful as soon as possible, instead of having to spend more money to fix something that may have been averted in earlier stages of the project.